This little 5x7 inch oil painting is one of my favorites. 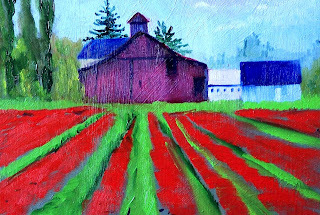 I painted it last spring when the tulips of the Skagit Valley were beginning to bloom and the wet rain of spring was still in the air. Although I really like this painting, it is time to say good-bye. I have listed it for purchase in my Etsy Shop. You can add it to your collection for $50.00 plus $6.50 for shipping by clicking on this link. August is almost over. While most of the trees are still green, there are signs of autumn. The grasses are turning red, the air is crisp, and moisture is apparent here in Washington State. Heavy clouds are lumbering across the sky and threatening rain on this long holiday weekend. Next week school begins and the weather is destined to change again. September in Washington state is usually warm and beautiful just as kids head back to their schools' clostrophobic classrooms without air conditioning. I hope they all enjoy this last wonderful weekend of the summer season before they drag themselves back to early morning get ups. 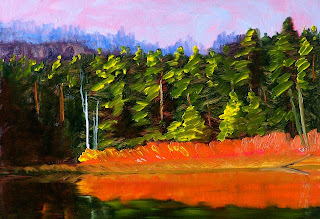 This little 5x7 inch oil painting celebrates the Labor Day weekend and the end of summer. 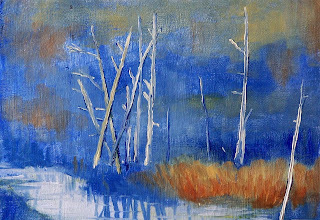 This little 5x7 inch oil painting is not only a tribute to the coming season, but an experiment with a couple of new tubes of paint. Gamblin's Transparent Earth Red and Transparent Earth Yellow were the focus of my efforts. 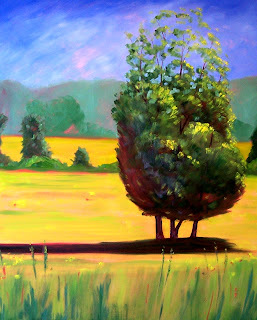 The distant row of trees was completed using just those two paints. A light layer of the yellow provided the light in the trees and the dark was provided by the red version. They compliment one another quite well and I'm anxious to use them on some further efforts. Mount Rainier, a dormant volcano in the Cascade chain of Western Washington State provides glorious views this time of year. A hike through the foothills displays one breath-taking view after another. 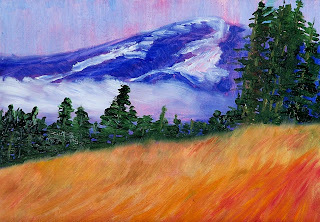 This little 5x7 inch oil painting was inspired by a hike I took in Mount Rainier National Park that left me wishing I had more time and a good pair of hiking boots. This painting can be purchased for $50.00 plus $6.50 for shipping to US addresses. Just click here. While I am still enjoying the benefits of summer, it is clear that fall isn't far off. The air has a crispiness, rain showers are becoming more frequent, and some of the trees are beginning to change color. 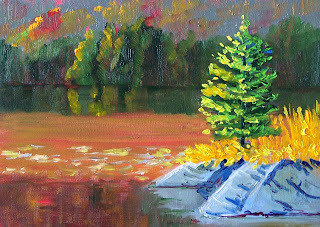 This little 5x7 inch oil painting is a greeting for the season's arrival. 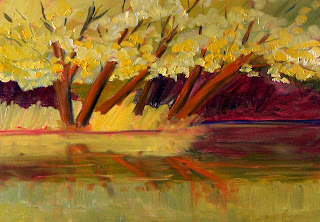 While the trees are characterized by the bright yellow of autumn leaves, the river bank demonstrates the use of impasto (thick paint.) 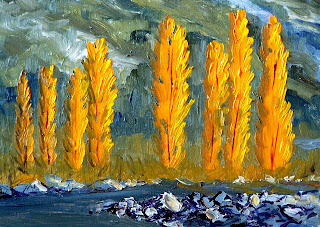 You can click here for some closeups of the impasto or purchase it for $50.00 plus $6.50 shipping to US addresses. 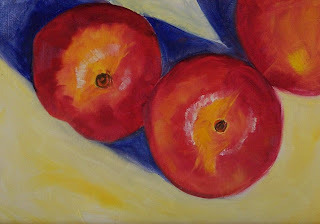 Painting these beautiful nectarines has been a lot of fun. I love the color, the shape, and the designs that begin to emerge by simply looking closely. 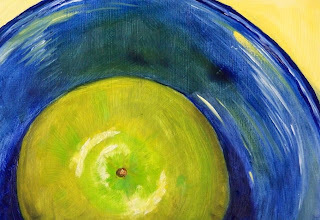 The cool reflections of a ceramic plate are a delightful contrast to the warmth of the fruit. Careful observation helped me create this 5x7 inch oil painting. I've listed this painting for sale in my Etsy shop along with yesterday's painting. Each is priced at $50.00 plus $6.50 for shipping to US addresses. If you click here you can view some closeups of the brushwork or purchase this painting. If you click here, you can purchase yesterday's painting. As August draws to a close, I have begun to think of all the wonderful things that were brought my way this summer. Sunshine, trips to the beach, warmth, and summer fruit are all on my mind. This little 5x7 inch oil painting celebrates summer in all its delights. If you click here, you can see some closeups of this painting. I hope others have enjoyed the summer months as much as I have. 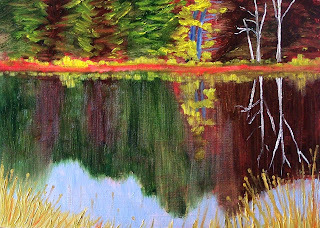 This 5x7 inch oil painting is another of my reflection pieces. I made an effort in this painting to use no greens from the tube, but mix all the greens. 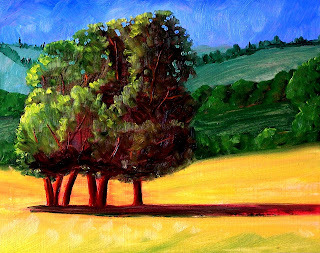 Cobalt blue and Cadmium Yellow Medium created the small amount of green that is visible in the water and leaves of the trees. Green is always a challenge because there are so many thousands of hues that comprise the color called green. I've been practicing painting reflections this past weekend. They offer their challenges. This 5x7 inch oil painting is one of my efforts. If you want to see some others, you can visit my Flickr photostream. Today's posting is a fun little 5x7 inch oil painting. It was inspired by sunshine on a hillside in the heat of a summer afternoon. The constrast between dark and light, warm and cool makes it for me. Closeups are available at this link--click on the thumbnails to see the brushwork. Today's painting is out of the ordinary for my blog. I usually only post my small paintings. Often I will take a small painting and convert it to a larger version such as I did with this 24x30 inch oil painting. Making the transition from a small painting to a larger version doesn't always work. The subject matter may not work well or the composition takes on a different emphasis when enlarged. I've had my share of disappointments in the process, but was pleased with this effort. You can see the original 8x10 inch oil painting by clicking here. I see a red and green theme is beginning to emerge. 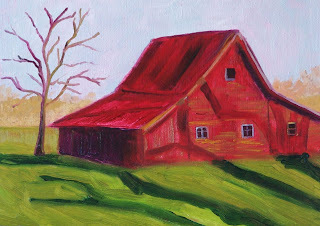 It was my fascination with the shadows that crept across the field and climbed up the front of this barn that provided my inspiration for this 5x7 inch painting. There are some thumbnails that will show you closeups of this painting if you click here. 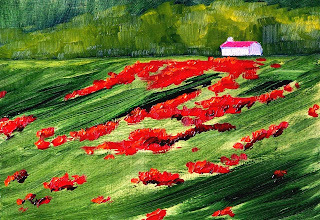 A bright field of poppies is represented in today's painting. I love the contrast of the green and the red and am always thrilled by the beautiful colors of wildflowers. 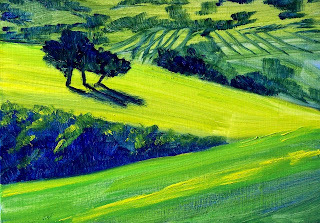 This painting is 5x7 inches on a gessoed hardboard. Click here for some closeups of this painting. 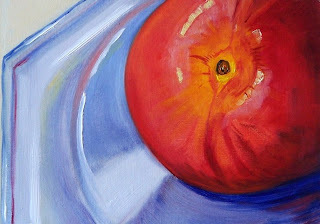 Another of my apple paintings is the subject of today's painting. 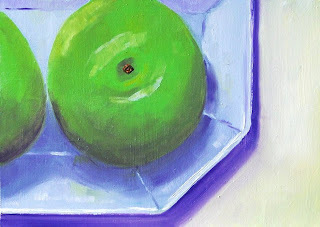 The color combination of green apples and purple shadows on the white ceramic plate were fun to create. You can see some closeups of the painting by clicking here. 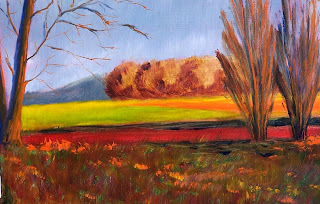 This painting is a 5x7 inch oil painting on a 1/8-inch gessoed hardboard surface. I like to paint on hardboard because it is not only an archival quality surface, but it is smooth and an easy surface on which to paint. Paintings on hardboard can last more than a lifetime if they are kept from moisutre and dampness. The apples are starting to fall from the tree in my backyard. The tree produces so many apples that we pick them in 5-gallon buckets. They have provided a lot of painting inspiration over the past few years. It seems I'm always painting apples once the tree gets heavy. This painting is a 5x7 inch oil painting on gessoed hardboard. It is one of a series that I have finally decided to sell in my Etsy Store. You can click here to purchase it for $50.00 plus $6.50 for shipping to US addresses. This morning I went for a bike ride. Autumn was in the air; leaves were on the ground, and the grass on the edge of the lake was turning color, too. I have mixed feelings about the coming change of season. Today's 5x7 inch oil painting represents change and new things to come. The weather has been delightful--until today. I went to an arts festival and half the vendors went home because of rain. So I painted the place I want to be--a warm summer landscape. This painting is 8x10 inches on a gessoed hardboard surface. Evening walks in the forest are pleasant this time of year. The colors and light feel intense and the air is comfortable. 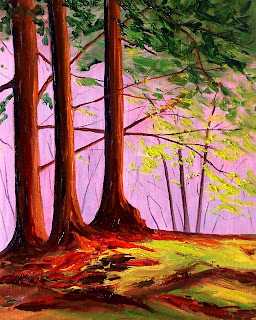 This 8x10 inch landscape oil painting was created after a walk at the Snake Lake Nature Center in Tacoma, Pierce County, Washington State. The thick forest canopy, the moss on the forest floor, and the redish bark of the evergreens attracted my attention and provided inspiration. The last couple of days has been a whilrwind of activity. I've been painting like mad, preparing boards, had my new bike tuned up, and discovered my Etsy Shop has been cited as a favored shop by Etsy seller, Acorn Beach, in a blog interview. If you scroll to the bottom of the interview, she mentions her five favorite Etsy Shops and I'm one of them! It is so nice to be appreciated. Today's painting is a 5x7 inch oil that was inspired by my recent trip to Mt. Rainier National Park. Not long after entering the park, visitors discover that the Nisqually River parallels the road. There are wonderful viewpoints of the river all along this road. Shortly though, the road meaders back into the forest and the river continues splashing its way toward Puget Sound. 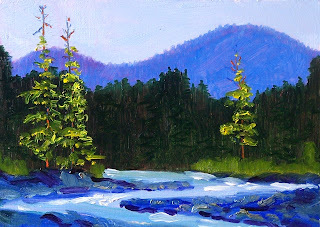 It was a pleasure to recreate a memory of my stop at the Nisqually River at Mount Rainier. Keeping with my summer Etsy schedule, I am posting this week's small painting. This one is a 5x7 inch oil painting on a gessoed hardboard. It is inspired by the colors of autumn which will be coming our way very soon. This little evergreen is brightened by rays of evening sunlight reflecting off the lake and warming the atmosphere. It can be purchased at my Etsy Shop for $50.00 plus $6.50 for shipping to US addresses by clicking on this link. 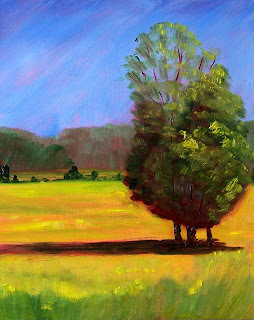 Afternoon sunshine and deep, dark shadows helped to inspire this 8x10 inch oil painting. The other day I squeezed out a pile of my favorite red paint, Napthol Red, and didn't use it all. Since then, I've decided to use it for underpaintings until the pile is gone or dried up, whichever comes first. 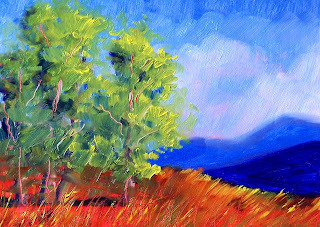 I love the warmth a red underpainting brings to a landscape--definitely a warm summer color. I'm still working large, but it is time to let my work dry before proceeding further. 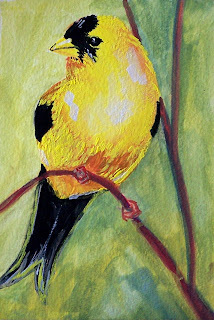 While waiting for the oil paint to dry, I'll share this little 4x6 gouache painting of the Washington State Bird, the Goldfinch. They are beautiful little birds that are seen far too seldom. Perhaps a bird house and a birdbath in my backyard would attract more of these delightful little creatures. Since it is a beautiful summer evening; I may have to paint another bird. I've seen some Hummingbirds lately hovering amongst the flowers. Today I worked on a large painting most of the day. Since I don't have a new painting to share, I decided to share a small 5x7 inch oil painting I created a while back in a paint challenge. I like the combination of the cool blue and the warmth of the dried grass.